I am not sure what the back story of this photo is. Two guys who look very fashionable are standing against a wall filled with Beatles graffiti. Do you think this was an ad for something? Are these guys models? Es muy rara, quiénes seran? The guy on the right resembles George Harrison a lot. 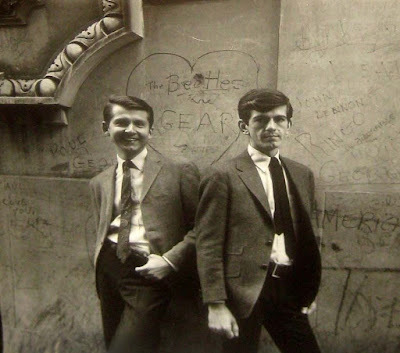 I wouldn't be surprised if they are members of another band, perhaps even from far away, posing in front of the Beatle graffiti. Any idea of where it's from? I'd assume England/Liverpool, right?